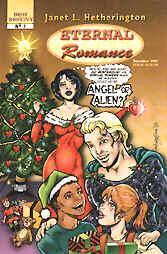 ETERNAL ROMANCE creator Janet Hetherington grew up reading all kinds of comic books -- superhero, science fiction, mystery and more -- including (sob! choke!) romance comics. 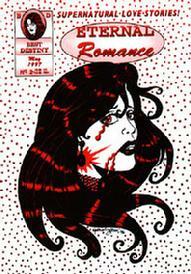 In 1997, there was a sad lack of romance comics on the comic shelves, so Janet decided to write and draw romance stories with a supernatural twist. Using the anthology format popular in romance comics in the 1950s, 60s and 70s, Janet has presented stories of vampires, witches, werewolves, mummies and more -- all yearning for love. Like many popular horror and mystery comics, ETERNAL ROMANCE employs a narrator named DESTINE who has a wise-cracking sidekick cat named ANKH. Of all the love-sick characters in ETERNAL ROMANCE, Destine has the most dating horror stories to tell. She quickly broke away from her narrator role and became the star of the ETERNAL ROMANCE series. The best stories from the first four issues have been collected into a trade paperback, ETERNALLY YOURS: ILLUSTRATED STORIES OF ETERNAL ROMANCE. This book also features Destine's origin -- the story of how she became an energy vampire. In 2007, ETERNAL ROMANCE celebrated its 10th anniversary. The stories have been serialized on the MyRomanceStory.com website and appear in color for the first time. If you'd like your own copies of ETERNAL ROMANCE, they are available on this site with PayPal payments. If you wish to purchase by check or money order, contact Janet at janethetherington@gmail.com. Welcome to the world of ETERNAL ROMANCE, where love endures and it's NEVER THE END. In 2008, Janet Hetherington wrote and illustrated a new, contemporary romance story for the GIRLS DRAWN WILD anthology to benefit women in crisis. Janet also created a short video for the story, featuring music by Ottawa composer Derek Audette. The video can be seen on Janet's YouTube channel.